The food I use and recommend is by Nutrisource. I find it at my local farm store, as well as Chuck and Dons, Menards, and other places. This food is a premium quality food, and has formulas for puppies from the first weeks, to adults (over 1 year), to the senior dog (9 years +). If you choose to change foods, please make the change gradually over the course of a week, and add 1/2 tsp of ProBios or a scoop of plain yogurt to help your dogs gut process the change. This is even more important with grain free foods than other foods. For Cotons de Tulear, I always recommend a premium quality food with a low grain content. Many experts recommend letting small dogs “self-feed” if possible, by leaving food available at all times. If you do this from the start, you should have no problems with weight control because your dog won’t eat simply because it’s excited about dinner time. Don't let your dog fool you into thinking they don't "like" their food just because they don't eat as much as you think they should. It is not unusual for a dog to skip a day or two of eating their dog food, they're not always everyday eaters. Especially if they found something better to munch on in the trash or off someone's plate! Lots of people make the mistake of letting their dog eat too many treats or scraps and then the dog learns they can hold out for something better than their healthy nutritious kibble. Small dogs especially can easily over eat when it comes to "people food", and that can cause a lot of problems depending upon what they're being fed. Keep in mind, if you feed no people food, your dog will do just fine on his complete nutrition kibble. However, if you would like to feed some fresh people food, if you follow a few simple guidelines regarding the feeding of people food you'll do much better. Get very familiar with foods that are dangerous to dogs and avoid them entirely. Feed only "clean" foods. One ingredient foods are best for your dog. Everything in moderation. Your ADULT dogs total food consumption is about 1 Cup of kibble per day, so portion sizes of anything should be quite small. It's best if all food given, (aside from training treats) is fed in their dog dish to avoid "begging" behavior. If you prefer to have specific meal times, or your dog won't self feed properly, just follow the recommended amounts on the package and adjust accordingly to keep your dog at an optimum weight. For puppies, dividing the daily amount of food into 3 meals a day is best. For adult dogs, 2 meals per day is best. If your puppy or adult dog still seems ravenous 20 minutes after eating, I would give them more (unless they have a weight issue, then discuss with vet). ​Please do take care to keep your dog at a good weight, your pooch depends on you for this. Over-weight dogs are not healthy dogs, and it can significantly affect their lifespan and quality of life. ​should be available for your Coton de Tulear at all times. A Minnesota Company! NutriSource provides Gallant Cotons with the fuel they need to thrive! 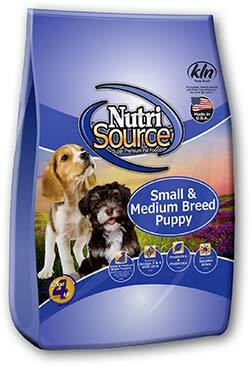 This tool will help you find a store local to you that sells Gallant Cotons preferred dog food, NutriSource. nearly any brand or type of dog food.